THIS IS ONE OF MY MOST FAVORITE BOOKS EVER!! I feel like I am saying that about a lot of these books but this one, I love, love, love. Everyone knows Viola Swamp and its just a book that sticks with you. 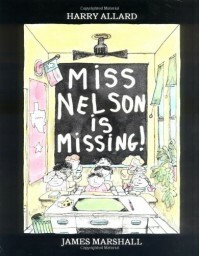 I love the idea of using this book when you are going to be out and use it as a writing prompt where the kids brainstorm why you are "missing" that day. I think you can read this at any grade level, its a classic to me.